I've found that in my case, the notion that once you give birth, you forget the intensity of the pain is somewhat true. That's perhaps the reason why this post has taken 6 months to be written. Or maybe I just didn’t think I could ever put it into words. As I mentioned in my pregnancy tag, my preference was for our little one to arrive at 38 weeks. So by 37 weeks I had most of my hospital bag items ready. My friend who was also supposed to have a baby around the same time as me had hers early - at 37 weeks! Another friend had earlier suggested a drink that I could take if I was keen to have my baby at about 38 weeks. I did a bit of research and found that while the drink mix appeared to initiate labour for some, it did nothing for others. Of course there was also the typical recommendations of pineapple and spicy foods like curry. 38 weeks came and I got rather indifferent - what was the rush really? I wasn't having a stressful pregnancy, the bump was not limiting my movement in any way and I don't know if I was really ready. I mean my life was about to change forever. At the very worst, it'd be another 4 weeks - so I simply decided to enjoy the time. But when I went in for my 38 week appointment in the third week of October, I knew I was simply tired of going in for ante-natals. The routines as I explained in my 1st- 3rd trimester post had become a bore. Even the scans did not provide a clear photo. My next appointment 40 weeks - was 4th of November and I I wanted to have our baby before then. My mum was also scheduled to come in on the 2nd and I really didn't want her to see me in pain - if that makes sense. Maybe I just wanted to feel brave and call her saying “hello, just popped out your grandson”. Plus I really hoped for an easy labour. On Friday 27th of October at about noon I was typing up this blog post on life lessons from Trevor Noah's born a crime - when the first contractions hit. You'd recall I had bought the book for my hospital bag but I ended up finishing it rather than early. I sprang out of my desk and ran downstairs saying to Tee that I think my contractions have started. They felt like painful period pains - and I hardly had period pains. I had to somewhat scream through them. But they were still bearable so we decided to time them. I'd be lying if I say I remembered how far apart the contractions should have been. I didn't. At about 2pm, I sent a message to my friends that my contractions had started. At times it'd feel intense and I'd have to bend over and hold my stomach. Then it'd stop and I could have a conversation. An hour later at about 3pm, I sent the girls a voice note at a time I felt it was intense - but they suggested that from my voice, it probably didn't sound too bad. At about the same time, we rung the labour ward. They advised that it was best we stayed home as it was probably early labour - but we could come in to the hospital if we felt we had to. We carried on as normal, I double checked that the bags were packed and I realised I didn't have a bare bump photo and this baby was going to be out soon. So I took some photos. At about 4:45pm I had been contracting steadily for about 5 hours and we decided to go in. By this time, the “mucus plug” had also come off – so I was certain this was labour. In retrospect, I'm not even sure why I picked the outfit I wore. But I did. It was an off-the-shoulder bodycon floral dress. I looked like I was off to a wedding and not the labour room. I put on some eyeliner and lipstick and had my rings and wristwatch on. And off we went. As we stepped out of the door Tee mentioned that we'd be returning to the house as a family of three and we also said a quick prayer. The drive to the hospital was roughly nine minutes and I'd intermittently take off my seat belt during the contractions. We also stopped to buy a lot of snacks and fruits – biscuits, grapes, bananas and drinks. The reception from the hospital was far from somewhat surprising. I expected some attention - I mean, I was in labour, hello! But seeing as I was in the labour ward, the midwives and attendants were probably used to all of this. After what seemed like forever, the midwife attended to me. Her first words were "oh you look too glam to be in labour". I kid you not. After she checked my vitals, she suggested checking how dilated my cervix was. "You're just one 1cm". 1cm?? To have a baby, it had to be 10cm. "We'd have to send you back home". She explained it was very early stages that they couldn't keep me in. Not till I was about 4cm. She reeled on about how it was best for me to be home in familiar surroundings - that apparently eases labour. So by 7:30pm we were back home. I honestly don't recall much of what happened that night. I tried to sleep but wasn’t very successful. I vaguley remember trying to see a movie and putting up an Instagram story in the middle of the pain. I think we went back to the hospital at about 10pm. Vitals and cervix were checked again. Still 1 cm and sent back home again. But we made it through Friday night. Tee says I kept squeezing his hands and he didn’t realise I had that much strength – his fingers hurt! In the early hours of Saturday morning at about 5am we had to go back in – I couldn’t bear the pain anymore. The midwife suggested Pethidine pain relief – an injection given on the upper thigh. I recalled it during my one day ante-natal class but I didn't pay that much attention because I didn't think I'd use it. After some convincing that it was okay and wouldn’t affect the baby, I opted for it. Anything to reduce the pain. So I was injected and I slept off. Pethidine definitely reduced my pain - I thoroughly enjoyed my sleep. It also helped that the room was quite spacious and the bed was wider than your typical hospital bed. I was very relaxed, ate a bit and listened to some gospel music. I think however that this must have slowed down my contractions. So even though I wasn’t in so much pain anymore, I wasn’t any closer to having the baby. The cervix only widens with the contractions. No contractions meant no further dilations. To make it all worse, I was sent back home yet again. I thought I’d be allowed to stay in this spacious not-so-hospital-like-room. So for the third time, we got into the car and headed home. This was Saturday, 28th October at about noon. It was also my due date and I wondered if this child was about to be super punctual. Time went by slowly. I recall simply rolling on the floor at times, and other times attempting to have a conversation. My poor husband was obviously tired. At this point he was very much in touch with our families – my mum in particular was so anxious. I recall speaking to her on the phone and she was crying more than I was! I assured her I was okay – just in pain, but she was surprised I wasn’t admitted at the hospital. She prayed, re-assured me and kept wishing she were there. Tee also had a major deadline at work. So in between timing contractions, and holding my hands, he was on typing away on his laptop. Our friend came over to check on us and brought some food as well. But I don’t recall being able to eat anything. Later that evening we went into the hospital again. Vitals checked. Cervix checked. And yes you guessed it. Still 1 cm. The midwife explained that this was very normal for first pregnancies and she had been in a similar state for about 72 hours. But his time, she offered a cervix sweep in a bit to open up the cervix more. After the sweep, the cervix was now 3cm – but we were still sent back home for the fourth time – because no signs of active labour. To cut the long story short, we were back in the hospital at about 5am – Sunday morning the 29th of October. 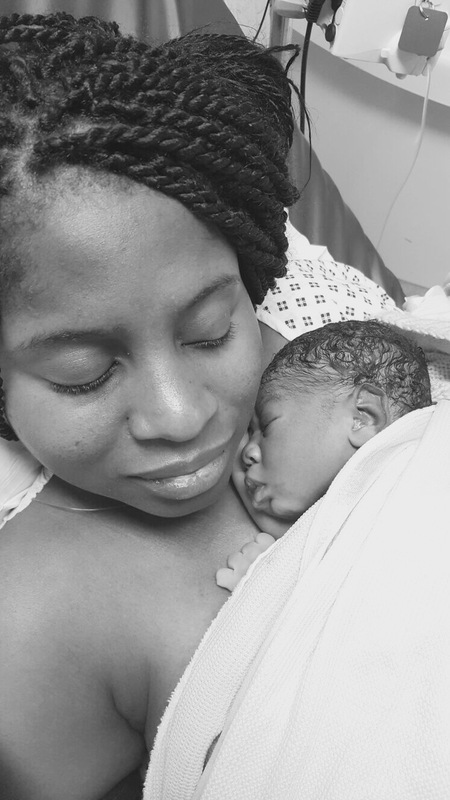 At this point, I started requesting a caesarean section – anything to have my baby out. I asked to see a doctor and have this operation, but the midwives explained that as there was no emergency, it was unlikely I could have a CS and everything was still on course. It definitely didn’t seem right to me. They strapped a couple of gadgets to my belly to monitor my contraction and baby’s heartbeat. As baby’s heartbeat was normal and not dropping – an operation was unnecessary. One of the midwives actually said that she could see the intensity of my contractions and they weren’t as strong as I made it out to be (*gasps*). But nonetheless, I was offered gas and air for pain relief. Like Simone said in this post, gas and air is really not effective pain relief. I was basically left on observation and given pethidine again. I slept again for some hours – felt no contractions or pain. But this time, the contractions didn’t exactly slow down. I just couldn’t feel them but Tee could see them becoming stronger on the machines. I woke up when the pethidine started to wear out and the pain re-surfaced. “You’re about 4cm and we can administer the epidural”. Finally I thought. Finally. I didn’t want to think about the fact that a 5inch needle was about to go up in my spine. I only prayed that the rather tall slim looking anesthologist would do it all correctly. I vaguely remember feeling the cold needle on my back and the pain beginning to ease up. Once I’d been given the epidural, the midwives broke my waters. Again, I slept. This time for roughly four hours. I awoke to a 10 cm fully dilated cervix. Woo hoo! It was time to push! I'm such a couch potato, that the other non-lying down positions of labour didn't appeal to me. The kneeling, or squatting styles. So I was glad no one suggested that. Instead I remained in position on my back with my legs on the bed with my midwife, Kelly, giving instructions. She had been so helpful and so amazing through it all. Tee had also acted like her assistant through it all. We joke that he could very well deliver a baby. “Push like you want to poop” she said. But it is at that moment you forget how exactly you poop. I didn’t think I was doing it right. And I was sad I wasn’t doing it right. I was tired. I really was. Kelly's shift was coming to an end, and she had to hand over to another midwife. I was somewhat sad as I hoped she'd have been there to see the baby after all her help. But she promised to come back asap. The new midwife, decided to raise my legs and place them on a pedestal. “If you push right, you’d push him out in like three pushes”. she said. At some point, I'd feel like I was pushing real hard, but still no luck. This may have gone on for a good half to three quarters of an hour. Several times, I thought to myself, I can't do this. Then I'd say a quick internal prayer. Tee came over to tell me how could see the head and baby's full head of hair. I think the midwife asked me to reach out and touch - but I didn't. I wanted to hold him when he was fully out, so I had to push. I’m not sure where I found the strength and it was almost an out of body experience that I don’t remember, but the final push, I pushed with everything and all of me. I may have screamed so loud as well – and he was out – into our world. It was done. A huge feeling of relief swept over me. The midwives wiped away some blood and fluid, wrapped him in a blanket and handed him over to me. No words. I can’t even say what or how I felt. But I did feel a rush of emotion. I was actually holding my baby! I was injected on the thigh to ease the release of the placenta – all the while holding him so close. At some point Tee, new father cut the umbilical code joining mother to baby. I tried to feed him for a bit. He immediately latched on with no hassle. Then we both took turns in skin to skin contact. Pretty much everything had gone well. We were a family of three. Gosh. Child birth is an experience. I’ve tried to write it out, but these words would never really capture it. The emotions, the pain, the thoughts, the prayers, the joy - and even little things like how crazy dry my lip was. And my experience of it all, is different from Tee’s experience (maybe I'll get him to share a few words). I think he was 'traumatised' - if we think of the fact that he saw it all. I, as the pregnant person couldn’t exactly see all that was going on on the other side. He could – he saw the baby come out, the fluids, the blood, the placenta. He thinks it’s an experience every father should be there for – if possible. And finally, that’s a wrap for the pregnancy diaries. I really did enjoy being pregnant, the entire journey and super thankful for this gift. Also saying a prayer for all those who seek this blessing. May your joy be soonest. pS: Most of the photos and videos were taken on Tee's phone whch got lost a few weeks after. So I haven't got that much of a record - which hurts. Feb 2 4 First Time Mums Share Pregnancy & Labour Experiences + What They Wish They Knew!